1.FreeBookSpot: In Freebookspot you can find different types of e-books form many of available categories e.g fiction, scientific,programming, engnireeing or many other categories. And here you don't need to register so if you looking for a free e-book to download then visit this site. This is another good online tool/source where you can find the latest and your required ebook for free. Before downloading and reading an ebook from its library you first need to be a member of this website. registration is free.you can also upload your own ebook here. 3.GetFreeEbooks.com:Another free website for downloading free ebooks is getfreeebook. It has also a huge collection of ebooks of your choice with a lot of available categories, which you can download freely. 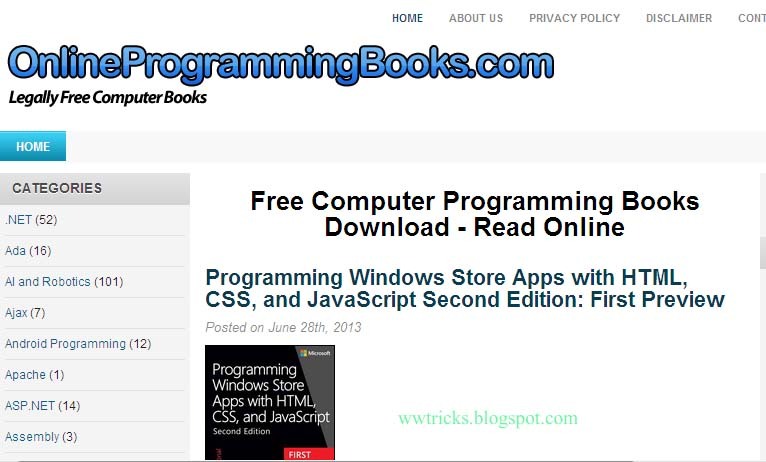 4.FreecomputerBooks.com: It has a huge collection of ebooks for computer programming, tutorials,kectures mathematical, tech etc.You can browse to your required topic as it categorized in 12 different topics and then about 150 subcategories are available. 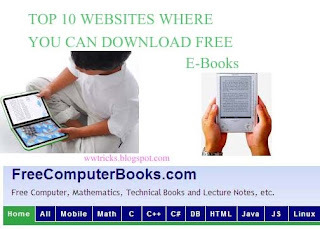 5.OnlinefreeEbooks.net: This website will give you links to ebooks(most are in pdf) of the 9 big categories. So try this website too. 6.BookYards.com: In this site books,education metarials, and informative contents are available free for every one. 7.BaenFreelibrary():This is an online free library where you can find and download science fiction novels free of cost. 8.Pdfooo.com/:This site contains over 29000 ebooks on the varios categories like business,technology,magazines, personal devolepment etc. So you can browse to your choice and can download it freely in pdf format. 9.onlineprogrammingbooks: Online programming books is one of the best website for downloading free e-books related to programming technology etc you can easily find your required ebook here as a lot of categories are available here. 10.Ebookee.org: This is a good place where you can search for an ebook you want to download it freely.As there are many categories available as you can see in the below image. I've created a list in Simulty, a website combinator we've recently launched, so you can search for your e-books in all sites simultaneously from one single tab. You Also Done A Good Job.